Our printed plastic cards are all produced in our own manufacturing plant using premium 680gsm PVC or PU plastic. This gives us complete control over the print and production process, meaning you get better prices direct from the factory, better support and faster turnaround times. Contact us today for a 100% obligation free quote & virtual sample by our in the house design team. We won't be beaten on custom plastic cards! People often assume a business card is nothing more than a way to share contact information with another party. These cards actually serve as a first impression of the individual and his or her business, thus the choice of card is of great importance. Printed plastic cards truly stand out in this area, as they provide a lasting impression on the recipient. Although they are similar to traditional paper business cards in a variety of ways, these cards add a level of sophistication to an everyday item. As a result, they attract attention wherever they are used. 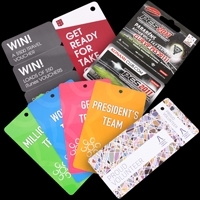 Major advantage plastic card printing has over paper counterparts is that plastic lasts for an extended period of time. An individual can store them in a wallet without worrying about the card being ripped. If the card is washed, it comes out in the same condition it was in before it went in the washer. Spill something on the card and simply wash it off, or users can throw it in a drawer and know it will be waiting when the information on the card is needed. The card holds up over time even when it isn't treated carefully. The same cannot be said of paper cards. Printed VIP cards are one way to use these cards other than as a business card. Event ID cards are another, and many businesses use these cards for their loyalty program. As they are both inexpensive and versatile, every business will find they can benefit from the use of the cards as part of an overall marketing plan. Be sure to check out the many options when it comes to these items. Businesses that take the time to do so will find this is one item they cannot live without when it comes to promoting their organisation. Each card can be designed to meet the specifications of the buyer. Some companies opt for key tags, yet others feel a plastic card similar to a credit card is a better choice. Regardless of which type is selected, the card may be printed with the company name, logo, contact details, or whatever the company feels will provide the best exposure for their business. The key is to determine what most appeals to the target audience. When this is discovered, creating the perfect printed plastic card is easy. Custom printed membership cards are durable, handy, and practical for a number of business purposes. Whether you’re looking for a way to create membership cards for your patrons or you’d like to create a loyalty program or a rewards card, these cards are the right choice. You can even customise them to meet your exact needs. We can help you make sure the cards are exactly what you’re looking for. Our basic plastic printed cards are available in a standard business-card shape. They’re a fantastic option for many different purposes, from creating rewards cards to event IDs. Custom shapes are also available, in case you’d like something other than a rectangle. You can also choose between snap-off membership cards, gift and loyalty cards, or RFID entry cards, among other common types. You’ll want to review all of your options to make sure you choose the right type of card for how you want to use them. You choose what’s on the card, including all images and text. You can use your business logo, work on an image and text with your business colours or create a completely unique card. You can even choose the shape of your cards, so you’re not stuck with a rectangle if you’d like something that’s really going to stick out more. We give you complete control so you can create the exact card you want. Once you’ve chosen the right card style and begun to think about your card design, you can choose from a number of different add-ons. If you’d like to create a high quality card for a loyalty program, for instance, we offer barcodes, sequential numbering, and magnetic strips. We even produce smart cards with RFID capability. We also offer RFID as well as holographic printing, so you can truly design the exact card you need for your business. If you’re unsure of which of these options will be best for your needs, make sure you contact us today. We can help you choose between various add-ons to ensure the cards you purchase are going to work for what you want to do. These cards are only available to wholesale customers and there is a minimum order of 100 plastic cards. This is done to ensure we can make all of the cards you need quickly and help keep our costs as low as possible. However, we can do just about any amount of cards over 100 and can always print more for you if you need more of the same cards later. Take your time and look through all of the options to choose what’s best for your business. Whether you’re interested in creating a loyalty program or you need an event ID for your employees, our printed plastic cards are going to be perfect. Contact our customer service team today if you have any questions about these cards or you’d like help choosing the right options for your business.